An Open letter of Atty. Regal Oliva, a Cebuano Lawyer, says Vice President Leni Robredo and Anti-Marcos groups to shut up because it’s their fault for lacking the foresight. Atty. 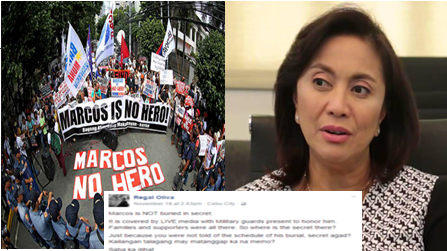 Olivia response to Robredo’s quote saying “like a thief in the night”, describing the decision of Marcoses buried at the hero’s cemetery. Marcos is NOT buried in secret. It is covered by LIVE media with Military guards present to honor him. Families and supporters were all there. So where is the secret there? Just because you were not told of the schedule of his burial, secret agad? Kailangan talagang may matanggap ka na memo? You claim that Marcos declared Martial Law as a surprise ("like a thief in the night"), and now he does it again in death. HELLO?!? You know that his burial was imminent, you should have prepared for it. Just because di natapos ang Philippine terno mo, para ma talbogan mo si Meldy, galit ka agad? The Marcos family respected due process, they never buried the late Ferdinand before getting a Supreme Court decision dismissing the petition to stop the burial. There was no law that was violated. Nothing is illegal in burying him. A decision was made by the final tribunal. They could have buried Ferdinand a long time ago - in secret. But they did not. They respected the Filipino people. So now that it is time for him to be buried, can you just at least respect the bereaved family and the dead? What you can do now is sour grape and shout all you want. Wounds are healing, and there you are mastering the art of being a bacteria by causing more injury to a wounded race. And you dare shout "HINDI BAYANI SI MARCOS"? Gaga! Alam namin hindi siya Bayani, Ferdinand ang name nya. Go talk to Agbayani and Fernando, silang dalawa ay Bayani. Etong fake vp na to parang nasakyan ng kaluluwa ni cory kung umasta. instead sana na si FEM pinag aksayahan nya oras nya ay magtrabaho cya gaga sayang lng tax ng taong bayan. kelan ba naging bayani si Dictador FEM, yun mga tao, nawawala na lang .basahin nyo ang "CONJUGAL DICTATORSHIP OF IMELDA AND FERDINAND. SINO BA ANG PAPA ni Imelda? sino ba ang papa in BONGBONG M.? si Donald trump ba ? lumandi kasi sa U S ,pati si Donlad Trump naging BF nya,buhay pa si ferdie ha .LOOK AT history of Imelda M sa you tube. Kasi gusto nilang malaman ang eksaktong araw at oras para makapaghanda sila. Isa sana itong oportunidad para sa mga masasamang tao tulad ni Robredo. Leni Robredo wanted chaos, she wanted violence, truncheoning, water cannons and she wanted someone injured and killed and exploit the situation and drag President Duterte all for their evil plans. Sorry nalang at naisahan kayo. Kasi mahina nga kayo sa pamumuno. Kayo ay mga PALPAK AT WALANG MALASAKIT sa bayan. LOVELY!!! YOU NAILED IT RIGHT! PERFECT to SHUT UP the big mouth and eyes of this FAKE VP Leni Robredo. KAPAL THE FACE. NOT FUNNY. LAWYER BA ANG SUMULAT NITO. PARANG PALENGKERA. AY NAKO, FAKE VP NG NGA,. TANGA PA! Ask ko lang sau kung alam mo, magkano ang binayad ng mga marcos sa bawa't isang supreme court justices na sumang -ayon na ilibing si ferdie sa lnmb? A painful slap to Leni.. she looks arrogant at this open letter. My God! I don't know what could Leni's reaction to this. Well, it's true naman. Atty. Oliva nailed it! I was just thinking of the same thing. Well, anyone could claim to be anybody in social media. It is libelous as it was written. However, it can't be used in court because she sounded like it is her opinion of the person being talked about. Nevertheless, a lawyer shouldn't be using words like 'gaga' because as you said it is unbecoming of her. True! It was indeed unbecoming of a "lawyer" to write such word. common sense! wala s robredo niyan. ang secret ung walang nakakaalam kya nga secret e. meron bang secret n live telecast sa social media. parang ung thief of the night na cnabi mo e ikaw ang gumawa nun. natulog lang kmi sandali ang laki n ng lamang mo sa counting. bago k mag comment tignan mo muna ung sarili mo kung tama b ung binitiwan mong salita. hindi nga nmin alam bka ung pagka atty mo fake din kc wala kang alam sa batas. Kahit na "palengkera" style, if it drives the message through effectively, mas mabuti na yun. Kesa mag-iingles ka na di mo naman masabi ng straight to the point, at wa epek, wag na lang. kung tinamaan sa "palenkerang" message na ito, e di wow. dilaw ka siguro. Marcos was a war hero until USA discredited him. Many loyalists want historical revisionism because it's reminiscent of Holocaust Denial to justify Martial Law and glorify Marcos Regime and Nazi Regime. sunog na naman si Lening mata ha ha ha kada buka ng bibig naghuhukay siya ng sarili niyang libingan.Nagkalat ang mga perpetual idiots sa yellowtard! no one said he was a hero. mga taong narrow-minded lang push ng push na di sya dapat sa LNMB dahil hindi nga sya bayani, but please, there's no law na ipinagbabawal na doon sya ilibing, he's a PHILIPPINE SOLDIER and that's it. He was one of those soldiers who deserves to be buried there. I thought time heal wounds. pero ung iba pagkatpos mghilom ng sugat babakbakin ulit para dumugo ng dumugo tapos ung mga biktima kuno ng ML hihikayatin pa ung mga kabataan na kumalaban sa mga marcos, ano bang alam namin? Bakit ba kasi kayo nag rebelde? wag nyo na kaming idamay sa sama ng loob nyo dahil hindi kayo tinext ni imelda na ililibing na asawa nya. hindi naman people power and nakapagpababa kay marcos eh, he was threatened by the CIA, his family was taken and he was forced to stepped down. Former President Marcos has the right to buried. But not to anger the whole nation, he should be buried privately. He should not be buried in the Hero's burial ground. Alam nyo ba gagawin sa taong binangungut??? di ba..sinasampal yan...sagpaa ra gud ..ako na lay sagpa kaha..we respect our late president..kung di xa hero sa inyo..di dili gud..para sa amo?? ?He is a HERO>...cge buaka kay paka jud ka.